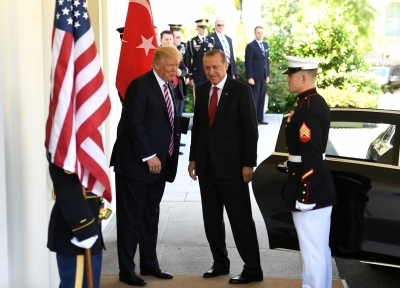 Ankara, May 18 (IANS) Turkish President Recep Tayyip Erdogan and his US counterpart Donald Trump met for the first time on Tuesday at the White House amid frictions on how to fight the Islamic State (IS) in Syria. During a joint press conference, Trump brushed aside tensions between the two NATO allies and praised Turkey’s fight against terrorism, Xinhua news agency reported. He was particularly keen on supporting Ankara’s long-time struggle against the military insurgency inside Kurdistan Workers’ Party (PKK), without mentioning the Syrian Kurdish militia the People’s Protection Units (YPG). The Trump administration has decided recently to supply arms to YPG fighters against the IS, causing tensions with Turkey, which says the Syrian Kurds are allied with the PKK, considered as a terrorist organization by Turkey, the US and EU. Erdogan praised the US president for his “legendary triumph” in the election but also warned his administration not to make “any discrimination whatsoever” between terrorist groups, in a clear message vis-a-vis the YPG which Turkey considers as one terror group. The Turkish leader has expressed readiness to open a “new chapter” with the new US administration after severe difficulties with the previous one led by President Barack Obama. Turkish officials including Erdogan himself qualified as “unacceptable” US weapon supply to Kurdish units in Syria, fearing that those arms will fall into PKK rebels hands. Despite no apparent agreements, experts think that is nevertheless a “good start” for mending ailing ties between the two allies, on the brink of a potential breakdown. “Yes, the two leaders are still divided on the YPG issue but the fact that they exchanged warm messages towards each other and on the importance of the partnership is still somewhat of a good start,” commented journalist Serkan Demirtas. A source from his entourage said that “this is a beginning and we have to wait and see how things evolve. We have explained them our grievances,” adding that for the moment there was no development on Gulen’s extradition to Turkey where he is facing lifetime imprisonment. Ibrahim Kalin, Turkish presidential spokesman, said in a communique that the issue, crucial and a priority for the Erdogan administration who recently won a referendum on granting executive powers to the president, has been mentioned during a working dinner at the White House. Soner Cagaptay, Director of the Turkish programme at the Washington Institute, said that “Erdogan got half of what he wanted already, which was to be invited to Washington” after his narrow and contested referendum win. “Erdogan was aching to get a western leader who would invite to affirm his victory” in the aftermath of the April 16 referendum that transformed Turkey from a parliamentary system to a presidential one, argued the analyst. Some 49 per cent of Turks voted against the constitutional changes while 51 percent in favor in a divisive electoral process. According to Cagaptay, the Turkish president might have also got “some concessions” from the Trump administration on the Kurdish issue. “I think that the deal President Trump offered to President Erdogan is that the US wants Turkey to look the other way as Washington arms the Syria Kurds to take Raqqa from IS, in return Washington is willing to look the other way as Turkey fights the PKK in Iraq and elsewhere where it has strongholds” , added Cagapatay.